These elbows were developed by the Edelbrock engineering team using the latest in Computational Fluid Dynamic software. 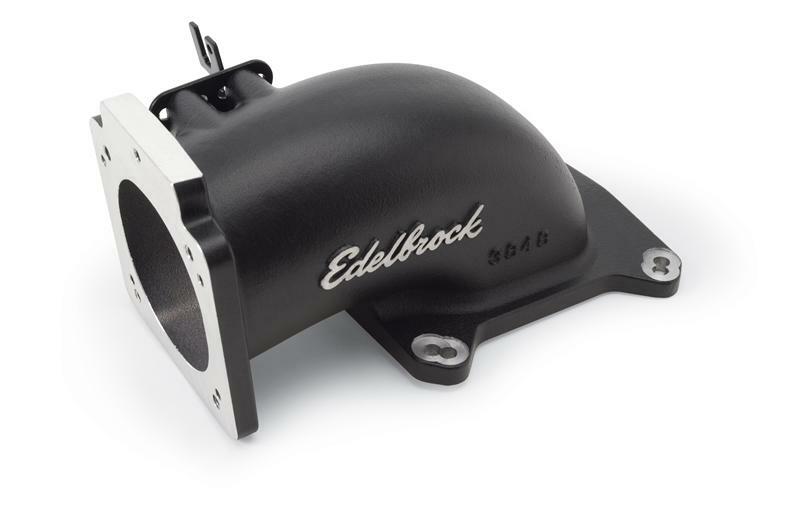 Edelbrock Throttle Body Elbows are the best way to adapt LS1, LS2 and Ford 5.0L-based throttle bodies to EFI manifolds with traditional square-bore mounting pads. An internal divider optimizes flow quantity and distribution into the manifold and they can be mounted forward, backward, or sideways on Victor EFI square-bore manifolds. Three versions allow EFI tuners to position the throttle body low for hood clearance or higher for maximum airflow. Available in Satin or black powder coated finish. All Edelbrock Throttle Body Elbows include a universal throttle cable bracket. These elbows are designed for use in high hp extreme race applications. An internal divider optimizes flow distribution to all ports of the manifold by reducing turbulence. High Flow Elbow #3849 is an ultra high flow version which measures 4.50” from flange to throttle body centerline (7.75” overall height). During flow testing this elbow provided up to 1,050 cfm with a 90mm throttle body and 1,150 cfm with a 95mm throttle body. Does not accept LS1 throttle bodies. Intake Elbow #3814 has a universal bolt pattern and is the best way to adapt a single throttle body to a Dominator® 4500 style flange EFI manifold without sacrificing air flow. The throttle body flange accepts 90-95mm LS1, LS2 and Ford 5.0L based throttle bodies. Intake Elbow #3815 is also engineered for use on a Dominator 4500 style flange manifold. It has a 120mm opening for maximum flow and is capable of over 1,400 naturally aspirated hp. The throttle body flange uses a 4-1/2” square bolt pattern. This elbow flows 1,850 cfm @ 20.5 in H2O. Includes a universal throttle bracket. These box style elbows add the great EFI appearance to carburetor-style EFI manifolds. Their performance matches our High Flow Elbow #3849 up to 400 horsepower. Forward Mount Box Style Elbow #3850 for forward mounted throttle bodies requires a two inch spacer to clear the waterneck on standard small-block or big-block Chevy applications. Sideways Mount Box Style Elbow #3851 is intended for sideways mounted applications. Both accept LS1, LS2 or Ford 5.0L-based throttle bodies. The low profile design measures 1.25” from flange to throttle body centerline with a 4.25” overall height. These adapters are required to install Edelbrock 5.0L manifolds #3821/#7126 on 1994-95 Mustangs. They must be used with Edelbrock or stock throttle body. The powder-coating is the same titanium gray used on the Performer 5.0L and Performer RPM 5.0L manifolds for a matched set. #3821/#3 are stock replacement and 50-state street legal for 1994-95 5.0L engines. Manifold will not clear stock strut towerbrace. #8025 not required when using Edelbrock TES header #6745.